Looking to upgrade your current Windows 7, Windows 8 or Windows 8.1, Windows RT or Windows Phone system to Windows 10, especially Windows 10 is free for everyone in the first year of release? Other than worrying about whether your system’s hardware specifications fulfill Windows 10 system requirements, Microsoft has also made known how you can install and upgrade your system to Windows 10 when it’s released summer 2015. In the Upgrading to Windows 10 event during WinHEC Shenzhen 2015, Microsoft published a slide which included Windows 10 Upgrade Matrix. 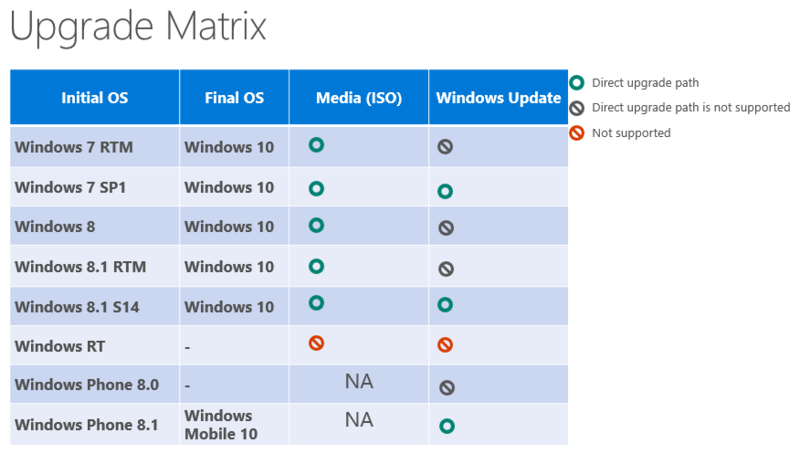 The Windows 10 Upgrade Matrix chart provides information on whether the current Windows operating system can be upgraded to Windows 10, and the methods which the upgrade can be performed. Basically they are two ways of upgrading to Windows 10 – through ISO or media and directly through Windows Update. Only Windows 7 SP1 and Windows 8.1 S14 system can be upgraded directly to Windows 10 via Windows Update. Systems not up-to-date such as Windows 7 RTM, Windows 8 RTM, Windows 8.1 RTM will have to download an ISO file or order a media and then install Windows 10 manually. Unfortunately, Windows RT users won’t be able to upgrade to Windows 10 at all. For Windows Phone, Windows Phone 8.1 can be upgraded to Windows Mobile 10, but not for Windows Phone 8.0. Interestingly, unlike previous Windows operating system, Windows 10 can be uninstalled, which should bring you back to original Windows OS version. In addition, Windows 10 also introduces “partition stitching”, where Windows will make the system partition larger if there is not enough space in the system partition to install an update, but there’s enough disk space in the user partition. Microsoft also intends to push latest updates to Windows Mobile 10 devices within 4-6 weeks of release through Project Milkyway.